Love to be held by mommyOriginally uploaded by Chris and Jenni. 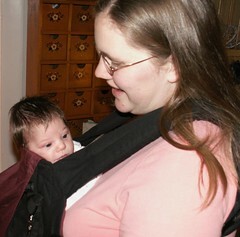 We were able to buy a wonderful child carrier called the ergo and we absolutely love it! It is such a great carrier, I have not been able to use child carriers because of my back problems but this one is amazing. It has great back support and I have been able to carry her around for literally hours and she still my back doesn’t hurt! Wow, happy mom, happy baby! She loves to look around and then when she gets tired she just sinks down and sleeps, such a great feeling to let my baby sleep on me, especially when I have two other little ones to look after, it wouldn’t happen that much otherwise! I bought my Ergo from a lady who sells them locally, she also has a website and you can look at them there, The Happy Healthy Baby. This entry was posted in Guenevere, Shopping. Bookmark the permalink. What can I say Jen. We are still of one mind even 2500 miles away. I just bought an ergo! How funny. I love it too. Must have been the Above Rubies magazine? That’s were I heard about it, so do you like it Nic?